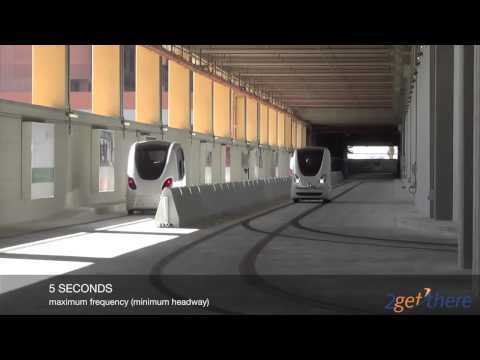 2getthere’s Automated Transit Networks (ATN) feature automated vehicles operating on a dedicated network of ‘guideways’. They are able to serve numerous origins and destinations, with the guideways optionally constructed at grade, with at grade intersections. Passengers benefit from on demand operations or at a high frequency. At the same time cities benefit from the reduction of car traffic, congestion and the environmentally friendly character. Developers maximize land value and reduce space wasted for non-value added activities. 2getthere deploys two types of automated vehicles in ATN networks: the 4 to 6 passenger PRT (Personal Rapid Transit) and the 16 to 24 passenger GRT (Group Rapid Transit). The PRT vehicles operate as automated taxi’s: on demand, connecting origin-to-destination directly, with passengers paying for the service per vehicle. The GRT vehicles resemble automated mini-busses: operating at a high frequency, with passengers paying for transit per seat. Typical applications include universities, hospitals, business parks and airports. ATN systems’ dedicated guideways ensure both safety and throughput, while the small and light-weight automated vehicles provide flexibility to operate in a network.They provide lower operational and life-cycle costs compared to APM systems. 2getthere is the leading supplier of ATN systems, with 4 applications realized to date. This includes the first (and only) automated vehicle system with at grade intersections at Rivium business park in the city of Capelle aan den IJssel (the Netherlands) and the world’s first PRT system at Masdar City (Abu Dhabi). In collaboration with Meraas, the Dubai-based holding company behind some of the city’s most popular urban destinations, Dutch technology firm 2getthere officially revealed the first Group Rapid Transit autonomous vehicle that will be used at Bluewaters. The new vehicle in Bluewaters livery was showcased during the UITP MENA Transport Congress and Exhibition, the most attended public transport event in the region. It is the first time that the public in Dubai will be able to get acquainted with this futuristic public transport solution. Bluewaters is a modern, family-oriented destination created by Meraas on a manmade island off the coast of Jumeirah Beach Residence in Dubai. No less than 25 autonomous vehicles will be deployed to transport passengers from Dubai Metro to the island. These vehicles are designed and developed by 2getthere, a leading technology firm in autonomous transport. The solution provided for the connection to Bluewaters is a perfect fit with Dubai’s Autonomous Transport Strategy, which was launched in 2017 by His Highness Sheikh Mohammed bin Rashid Al Maktoum, Vice President and Prime Minister of the UAE and Ruler of Dubai. In line with this ambitious strategy, 25 percent of all transportation trips in Dubai will be smart and driverless by 2030. This year’s edition of the UITP MENA Transport Congress & Exhibition is based on the theme ‘Pioneering for Customer Happiness’, recognising that customers are at the core of public transport service. According to Robbert Lohmann, CCO of 2getthere, there is therefore no better opportunity to present the Bluewaters autonomous vehicles to the public. 2getthere will realise the project through its Middle East Joint Venture with United Technical Services. 2gethere can be found on stand no. 5C52 of the UITP MENA Transport Congress and Exhibition. [one_half] Bloomberg Brink is a new original series exploring the revolutionaries, dreamers and disrupters reshaping the future of entire industries. As part of their series Bloomberg Brink also reports on Masdar and the PRT (starting 14 minutes into the report). May 13 (Bloomberg) — The United Arab Emirates – a country enriched by its massive oil reserves is looking to position itself as a leader in a post-petroleum world. So they’ve built Masdar City, a low-carbon, zero-waste urban center that could sustain a 40,000 person population, 1,500 clean tech businesses, and 50,000 commuters while using 20% of the power of a conventional city of a smaller size. [one_half] The centerpiece of the project is the Masdar Institute of Science and Technology, a post-graduate university established in partnership with MIT that aims to be a hotbed for future innovation. [one_half]On November 20th 2012, just two years after the official opening of the PRT system at Masdar City, the system welcomed its 500.000 passenger. An important milestone for Masdar and the PRT system, showing the great appeal of the development and the transit system as an integral part of it. The milestone passenger was visiting Masdar as part of a group of students being introduced to Masdar and the Masdar Institute of Science and Technology. [/one_half]2getthere is content and very proud of the achievement, as it confirms the passenger load handles is approximately three times higher than originally expected. The system continous to operate well, achieving a system availability consistently above 99%. [one_half] Fully Charged is a weekly video podcast from the creator of ‘Carpool,’ Robert Llewellyn. The show takes a look at the realities of using electric vehicles, looking behind the myths, seeking the truth about electric cars. Llewellyn launched his original Fully Charged pilot in June 2010 with the aim of creating an internet TV series about cars that “don’t go vroom or drift sideways on airfields”. 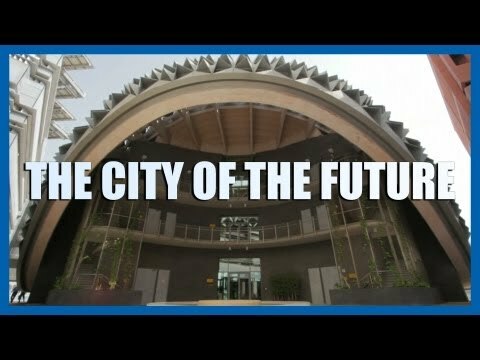 In this series he also visits Masdar City and the PRT system, dedicating two episodes of his show to the sustainable city. [one_half] The application at Masdar has been operational for over 15 months now, with the passenger number still increasing. February 2012 marked the most passengers using the system to date, even though no special events were organized at Masdar during this period. The trend-line shows a good growth over the past period and with the significant increase in passengers in February, which is continuing in the first week of March, it is expected that the passenger number will continue to rise. Especially also in light of the fact that the next phase of Masdar will open later this year. Actually the only ‘dip’ in the passenger number occured during the hot summer months in 2011, which coincided with the Ramadan period. The opportunity was taken to cease the operations of the system in favor of construction works ongoing for MIST phase 1B. The system availability over the months of operations remain stable, at >99%. [one_half] His Highness General Sheikh Mohamed bin Zayed Al Nahyan, Crown Prince of Abu Dhabi, Deputy Supreme Commander of the UAE Armed Forces visited Masdar on October 19th. Accompanied by His Highness Sheikh Hazza bin Zayed Al Nahyan, National Security Adviser and Vice Chairman of the Executive Council, he emphasized the importance of Masdar’s function, through both its international and local projects, as a national long term, strategic initiative aiming at developing and implimenting renewable energy solutions to answer to growing energy demands. He commended Masdar for achieving great successes in a short period of time stressing this as proof that the company is on the right track and achieving steady progress. At the onset of the tour, His Highness the Crown Prince, accompanied by His Highness Sheikh Hazaa bin Zayed Al Nahyan, boarded the Personal Rapid Transport (PRT) System, a zero emission, driverless transportation vehicle that can move at 40KM/hr, to the Masdar Institute, where he enjoyed an explanation of Masdar at a glimpse through the multimedia wall located at the PRT station. His Highness then proceeded to the semiconductor laboratory and the Masdar Institute Clean Room, the Earth Observation and Environmental Remote Sensing lab as well as the Interactive Artificial Intelligence lab. VIPs previously travelling on the Masdar PRT system include Secratary General Ban Ki Moon of the United Nations, Sheikh Majid Bin Mohammed Bin Rashid Al Maktoum, Prime Minister of Spain José Luis Rodríguez Zapatero and Prinses Victoria of Sweden. [one_half] Masdar City announced ‘The Market@Masdar City’, a family-focused street fair and organic market, will be organized again on October 28th. The market offers Abu Dhabi residents a glimpse at life in one of the world’s must sustainable, urban developments. The event is free to the public. The Market@Masdar City will feature recreational activities for the entire family, including entertainment and games for children. 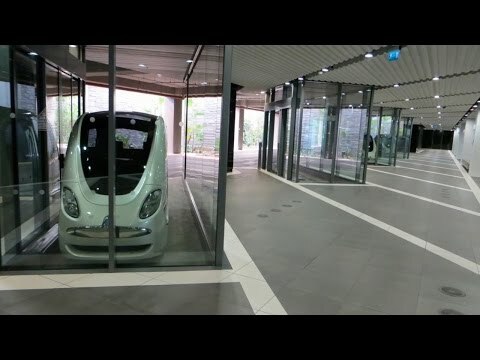 In addition, visitors will have an opportunity to ride Masdar City’s electric driverless Personal Rapid Transport (PRT) pod cars, which will whisk guests to and from the MI campus. During the last market the PRT was one of the most popular aspects of the event. As the project’s chief service engineer, Duiser troubleshoots the cars’ electrical, mechanical, air-conditioning, and wireless networking systems. With mere weeks left before he must hand over control of the transit system to its operators, he takes a break only when the local authorities want to show it off to visiting sheikhs or delegations from China and Europe. Masdar City is a carbon neutral, car-free city, featuring Personal Rapid Transit (PRT) to accommodate mobility. Phase 1A of the Masdar PRT system is approximately 1.4 kilometers long and features 2 stations: the North Car Park and the Masdar Institute for Science and Technology. The system opened to the general public on November 28, 2010, while the system availability and vehicle reliability consistently exceed 99.6% and 99.9% respectively. The PRT system is operational 18 hours a day, from 06.00hr until midnight, every day. The 10 vehicles operate on-demand, featuring angled berth stations allowing for independent entry and exit of vehicles. The system is carrying 5 times the anticipated amount of passengers, averaging >85% average occupancy during the weekends. On May 22nd, 2014 the system carried its 1 millionth passenger, with the 2 millionth passenger expected in November 2016. The vehicles are entirely powered by Lithium-Phosphate batteries, allowing a range of 60 kilometers on a 1.5 hour charge. The vehicles are recharged at the berths. With Masdar City hosting numerous VIP visitors, including many heads-of-state, the PRT system has probably carried more notable passengers than any other transit system in the world. Ranging from Shaikh Mohammed to King Willem-Alexander, Ban Ki-Moon, Angela Merkel and prime minister Modi, as well as actors and sports stars, they have all enjoyed the ride on 2getthere’s PRT system. The appreciation for the service and innovative character is also evident from the posts on social media, especially Instagram. 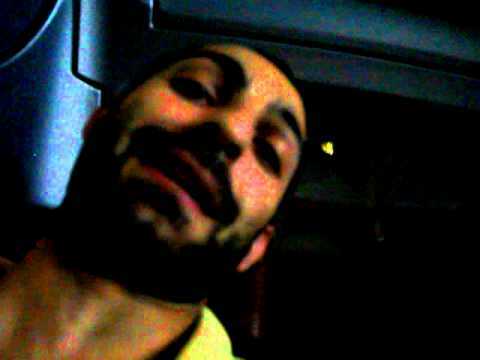 For the video please click the here. [one_half]At Masdar City 2getthere is also introcuding the concept of Freight Rapid Transit (FRT). The FRT vehicles now still are flatbed vehicles, as they still need to be equipped with their load handling mechanism. Originally envisioned as being a roller bed, the concept is flexible and the logistics service provider at Masdar will determine the final mechansim being installed. In this phase 3 freight vehicles will be delivered to the development, capable of carrying up to two pallets with a combined weight of 1600 kilo. The vehicles feature a slightly larger engines and brakes, ensuring they can achieve the same acceleration and deceleration as the PRT vehicles in the network. After the recent World Future Energy Summit 2getthere’s CyberCab PRT system has been named the coolest green innovation. During the WFES one of the 1st series vehicles was on display at the Abu Dhabi National Exhibition Centre, while a 2nd vehicle was used in demonstrations on site.